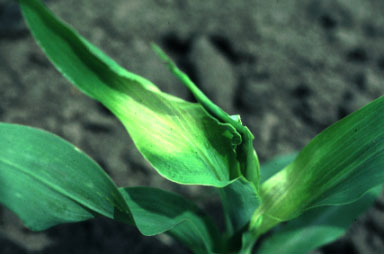 This section displays herbicide injury symptoms based on the mode of action of the herbicide, e.g. 2,4-D is in the Growth Regulator family. Select the "Classified by Herbicide Active Ingredient" link to view the section on herbicide injury symptoms based on the common name (active ingredient) of the herbicide. Most herbicide products will list the common name under the active ingredient section of the label. A cross reference list of trade names and common names can also be found in Weed Control Guidelines for Indiana WS-16.